The website with static HTML code in action now is an ancient thing. This is the traditional way of developing a website. At present day, PSD to HTML Or URL to PSD then HTML to WordPress and PSD to WordPress conversion - which is being used the most. The problem with the traditional HTML website is that it's Script and Style. Both are coded in HTML framework. Thus, the loading time of the website is slowing down the whole performance of a website than the other web development techniques. To overcome this problem, web developers came up with an effective and trendy HTML to WordPress conversion technique. It is totally beneficial converting a static HTML website in dynamic WordPress Site. WordPress is just not an efficient blogging platform, albeit it is a platform to create a perfect website. There are a number of benefits offered by WordPress when it is been considered as a platform for any type of website development. One more thing is that the HTML websites are static in nature and it is complicated to make even a minor change. As it would be achieved by editing the actual code file. To avoid that, the HTML to WordPress conversion is one of the easiest option among all the available options. When you will switch to WordPress Development, you can simply login into your WordPress website and will be able to add new pages/blogs/posts without paying a single penny after the development. It is easy to use, as it gives an optimum user interface. Also, this makes very easy to create or update new content on your website. WordPress has a tremendous number of WordPress Plugins, through which you can add functionalities to the existing system. You will be able to make all type of changes if you have the credentials of an admin panel. With WordPress Development, there are no limits on how much the website is able to increase sales, traffic, popularity and visitors. The rapidly increasing popularity of WordPress is dominating the Web World. Here are some of the compelling key features tells, why it is better to switch to the WordPress Web Solutions. WordPress is the easiest among all the other available platforms. However, if you stuck, you will get 24*7 of online community support. CMS offers a variety of additional themes and plugins. Thus, the whole WordPress Development Services will be much easier. The theme is the most essential part of web services. The unique yet simple theme gives the best UI/UX as well as it provides a definite look to the plugins and website. With WordPress, you need minimum lines of code and less technical support. This is the prime reason that most of the organizations and start-ups prefer WordPress Development. The traditional HTML websites are static, having numbers of pages and lengthy coding lines. 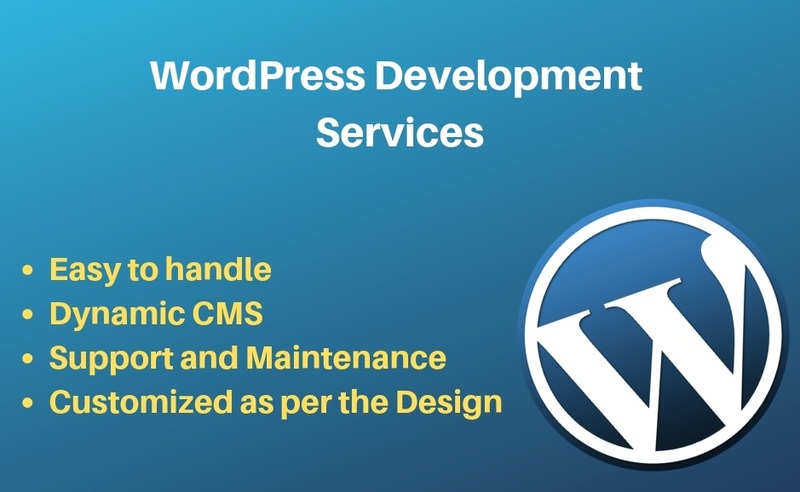 WordPress Development Services for Website Customization needs minimum lines of code and requires less time to complete. Also, they are easy to update. As it was originally developed for the publishing processes with a huge number of functionalities that are all embedded in a single platform. And that is what makes WordPress a fully Dynamic CMS. WordPress has a vibrant community of developers. That supports developers as well as users if they got stuck at any point. Meanwhile, the most important thing which cannot be overlooked is, it is an open-source platform and the developers are ceaselessly contributing to the WordPress Website Development Services. Also, it updates frequently and the users will be notified with the changes happening in WordPress Arena. The maintenance will be effortless and less time-consuming makes the whole process smooth. Each passing day WordPress Developer community is growing bigger and better. WordPress offers customization options as per your requirements. The WordPress Theme Development may look like a complicated job, but it is easy to accomplish with the support of Dedicated WordPress Developers. Thus, it is easy to utilize, albeit as per business preferences. The functions and looks can also be changed further for the benefit of the business or as per the future requirements. For customization, one can start it from the scratch or choose from the available themes. The above discussion has compelling reasons on why the WordPress is most preferable Web Solution over other tools and technologies related to Website Development. Additionally, WordPress Web Development is the most preferable option for website development, yet one need to keep mind that there is nothing like a website that has been developed by an experienced WordPress developer. Having a huge number of advantages with WordPress Development, switching to this splendid platform is indeed advantageous due to a number of reasons. Presently, in this rapidly changing competitive business world, having the dynamic WordPress website profoundly the ultimate solution for business growth. Plus you are now able to make any changes as per your need from your end.